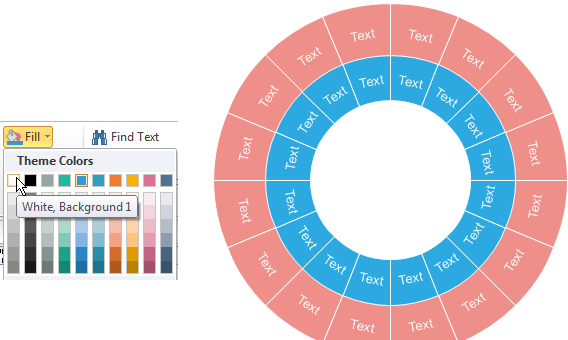 Create a multi-level circular chart by modifying the pre-defined circular chart template in Edraw. This tutorial will show you how to make a multi-level circular chart out of the circular symbol (template) in the predefined library. It's really easy if you get the techniques. In the Circular Charting Shapes library, you can see a great variety of circular shapes for different purposes. Which one is the best to make multi level circular chart? Usually we will use the Circle 6 for multi-level circular chart. Select the shape, and click again on the ring you want to set. Then a floating button will appear on this ring. Click the floating button and choose "Set Segment Number". Input a number in the pop-up window. From the same floating button, click "Change Gap Size", and input "0" on the pop-up dialogue. Apply a color for the ring, and set the line with white color. Select the shape, and click the floating button on the top right corner of the center circle. Choose "Add a Ring" to add more rings. 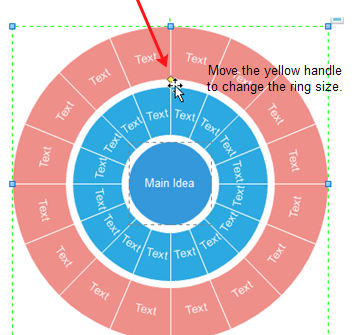 Select a ring, and move the yellow control handle to change the ring size. If you want to hide the center circle, simply fill it with white color. Download Edraw and see how quickly and easily you can make Circular Chart.